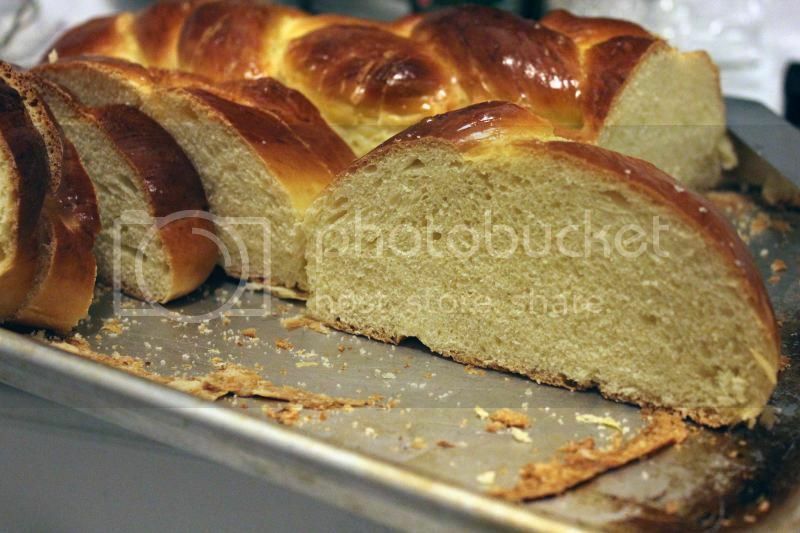 Did you know, I'd never had challah bread before making this homemade version? It's true. Unless I ate it unbeknownst to me at a restaurant at some point, which I suppose is entirely possible. Truth be told, I had never even heard of it until probably a few years ago. Or if I did hear it, I probably thought someone was just saying holla and didn't think twice. Which is really sad, because ummmm.... this bread is pretty great. And I love me some bread. It's not without some work, mind you, but you'll probably be really happy you put in the time once it's done. Plus, this makes two loaves, so you'll feel really accomplished, and you can totally freeze one for later so you don't have to do it all again. This bread is particularly great for things like french toast, which is always better with a thick bread, grilled cheese sandwiches, and even BLTs with your pieces just toasted. Tell me you don't want to take a big bite into that right there. 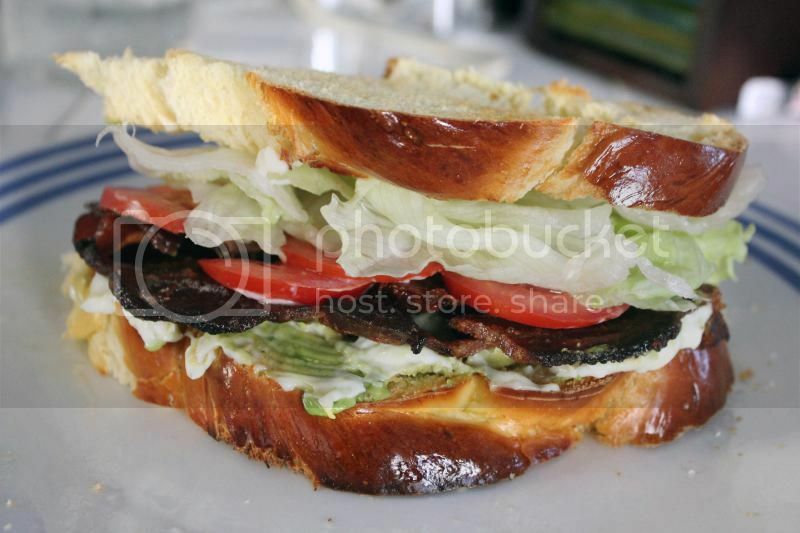 Bacon, lettuce, tomatoes, and even some avocado too, plus homemade bread? Yes please. I will not lie to you, though, the braiding part is kind of hard. Unless you've done it a bunch of times already, then it's probably easy peasy lemon squeezey, but I only know how to do a basic regular braid, man. I can't even do the fancy french braids the girls used to do in junior high. Or those fishtail ones? I mean, that was entirely foreign. Ah, the days when we'd braid our hair during leadership class... good times, good times. 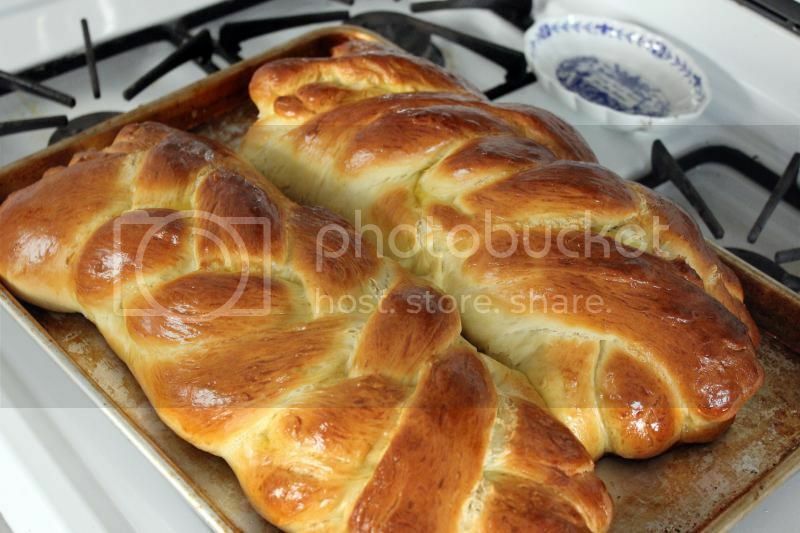 The classic braided Challah Bread, great for French toast, sandwiches, and just to eat with some butter slathered on! In a large bowl, dissolve the yeast and the 1 tablespoon of sugar in 1 3/4 cups lukewarm water. Not too hot, not too cold. As Goldilocks would say, juuuuust right. Let that sit for about 5 minutes to get activated and frothy. Whisk the oil into the yeast mixture, then beat in 4 of the eggs, one at a time, with the 1/2 cup remaining sugar and the salt. 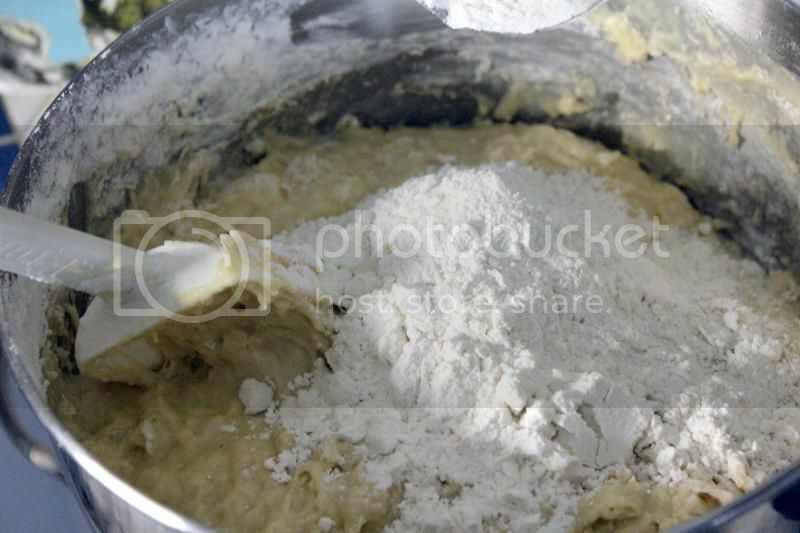 Gradually add in the flour, one cup at a time. 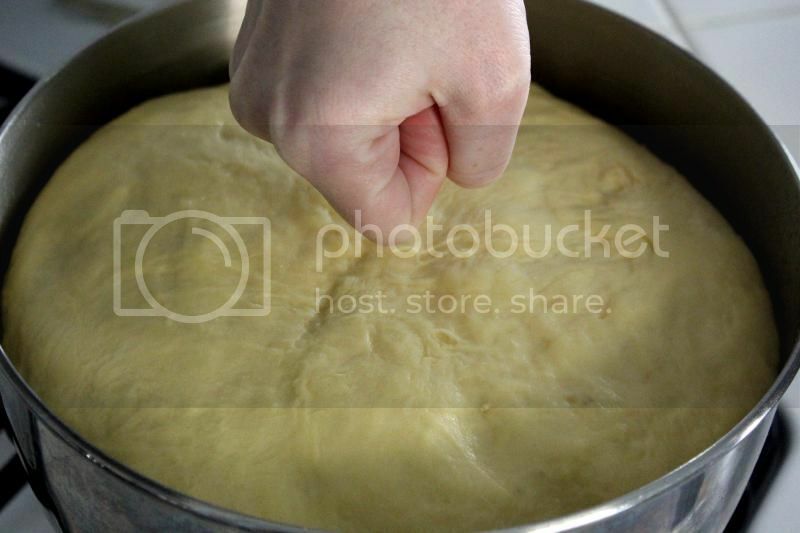 When the dough holds together, it is ready for some hand kneading. You can use a mixer with a dough hook if you want, but not if you have the basic Kitchenaid like me. Doing too much dough hooking will kill your motor. Truth. 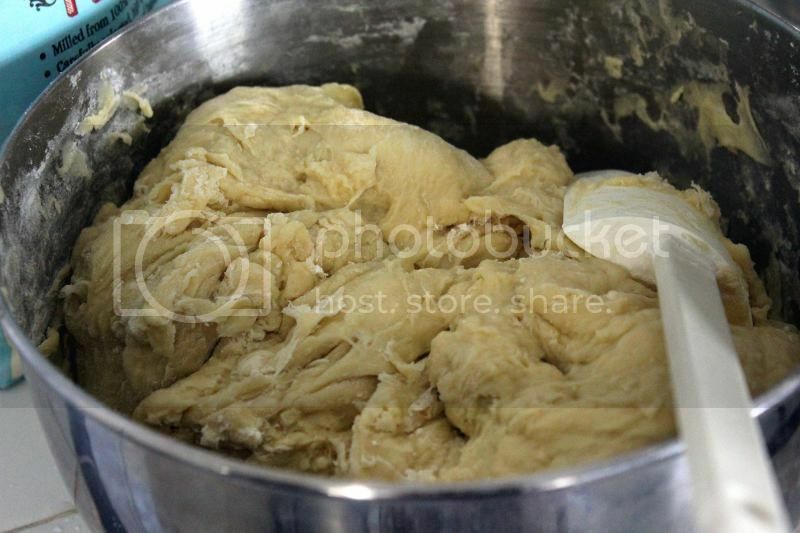 Turn the dough onto a floured surface and knead until smooth and elastic. Either clean out your bowl from earlier or get another big one and grease it up. 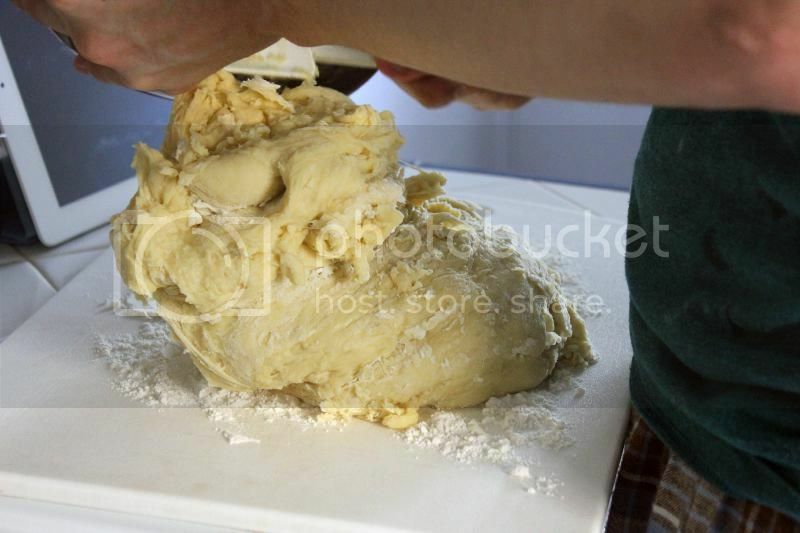 Return your dough to the bowl, greasing both sides of the dough. 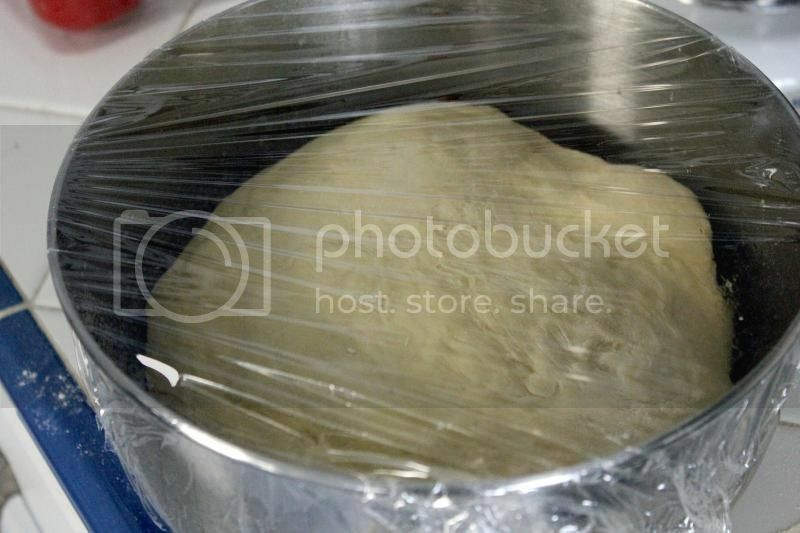 Cover with plastic wrap and let rise in a warm place for an hour, until almost doubled in size. 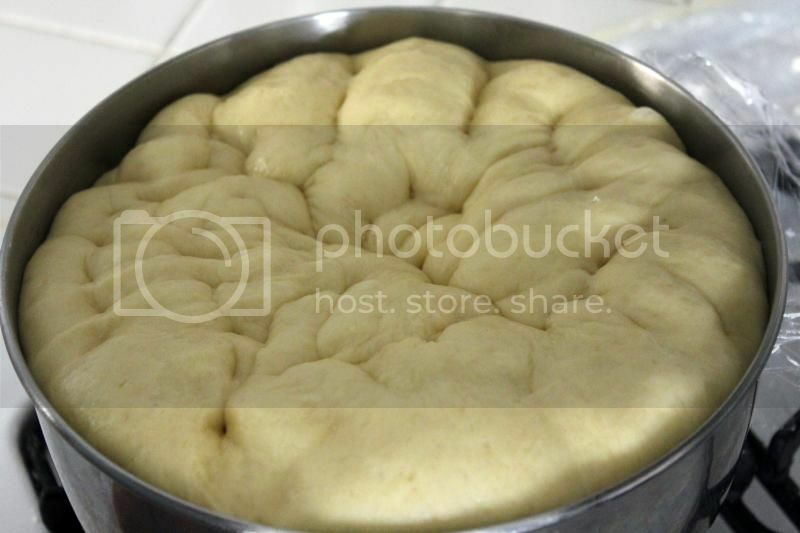 Your warm place can be an oven that was heated to 150F and then turned off before you stick the dough in. 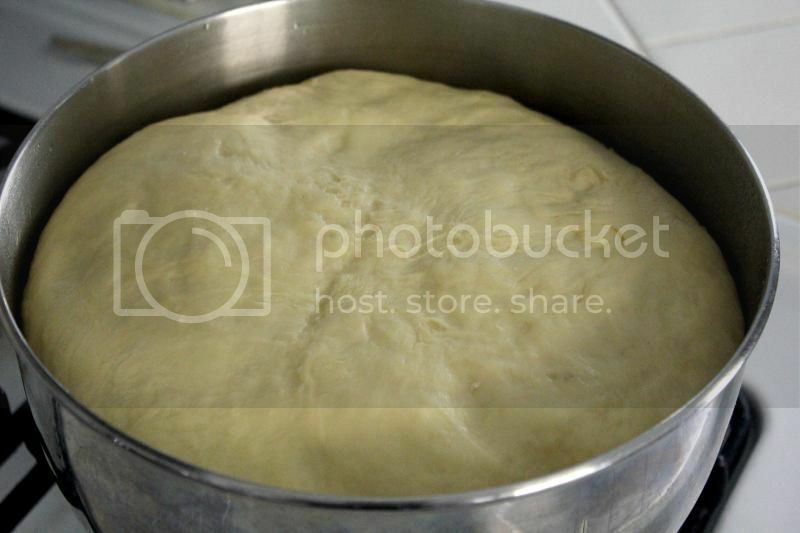 After the hour has passed, punch down the dough and let rise again in that warm place for another half hour. Now it's time to form the braids. Honestly, I don't have good directions for the braiding. The ones I read were confusing, and we kind of just made it up as we went. 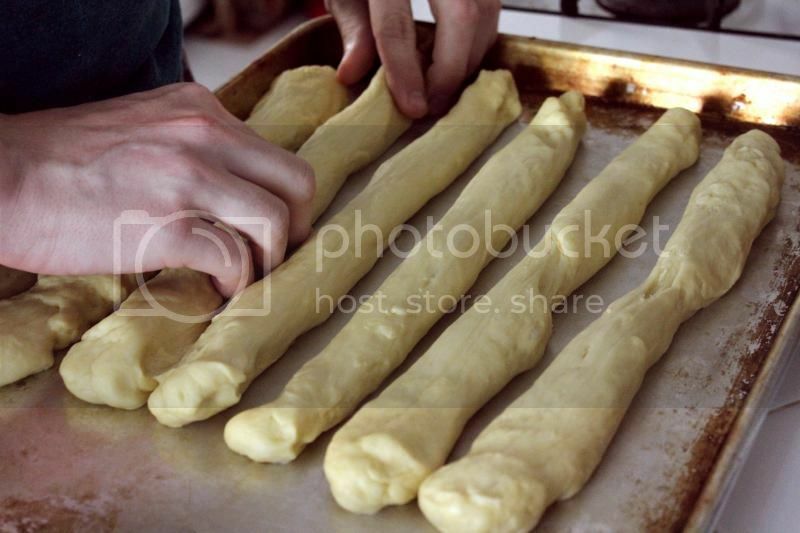 Basically, you split your dough in half, then from that half make 6 balls the same size. Roll those balls into strands about 12 inches long and 1 1/2 inches wide. 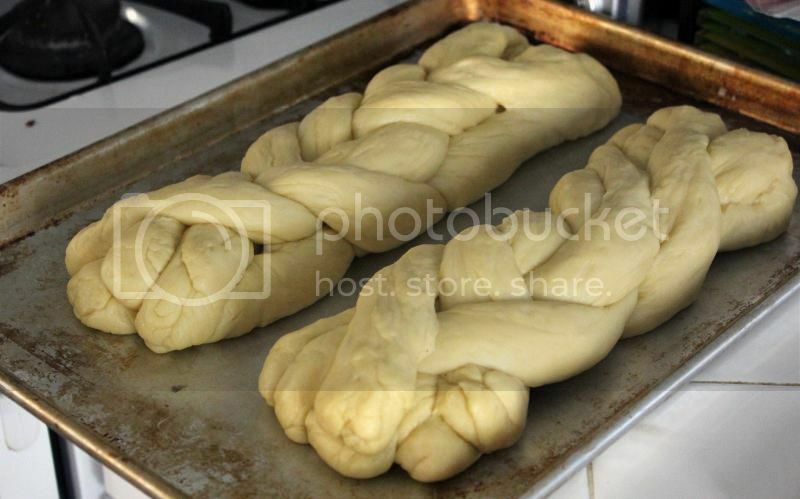 Place them in a row next to each other, pinch the tops together, then... braid. You can try following these directions. After you've got your braid, pinch the bottom ends together. Repeat with your second half. You can also turn it into a circle if you prefer. 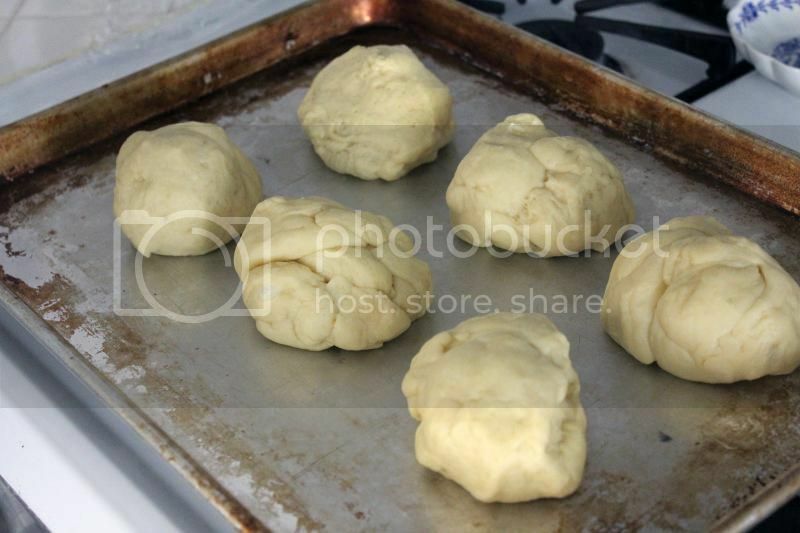 Place the loaves on a greased cookie sheet about two inches apart. 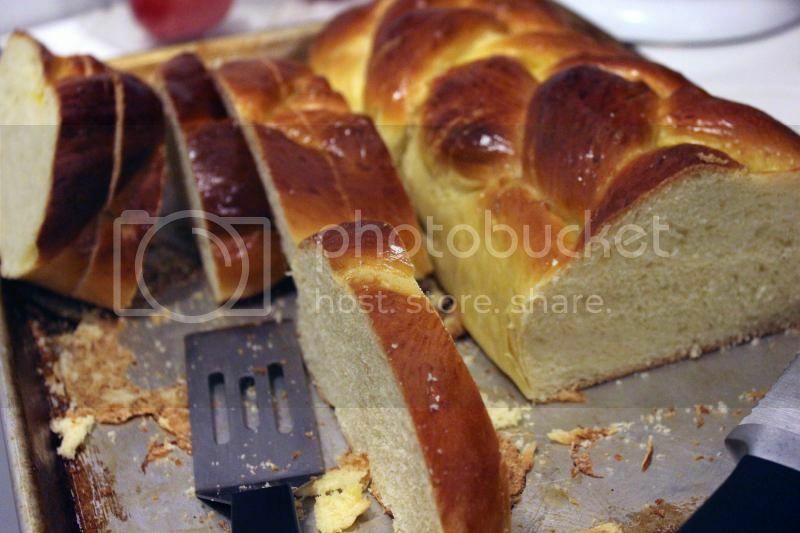 Beat your 1 leftover egg and brush it on the loaves. Let rise another hour, and keep that egg for after the hour. Preheat the oven to 375°F and brush your loaves again with the egg after the hour has passed. At this point you can sprinkle with poppyseeds if you so desire. Bake in the middle of the oven for 30-40 minutes, until golden. If you have a fancy thermometer, the insides should be 190°F. Cool the loaves on a rack, then get to slicing! 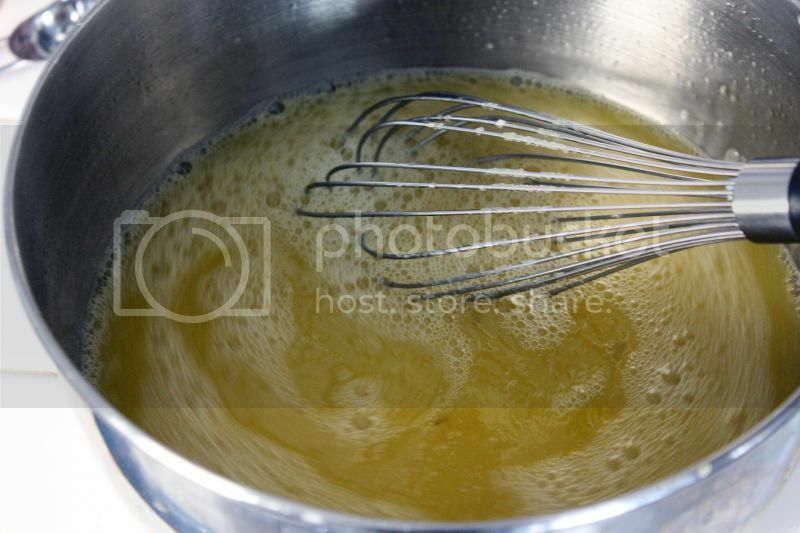 Yeast and 1 Tbsp sugar go into lukewarm water, then you whisk in 4 of your eggs and the other 1/2 cup sugar. It's very liquidy. It's fine. Start mixing in your flour, 1 cup at a time. 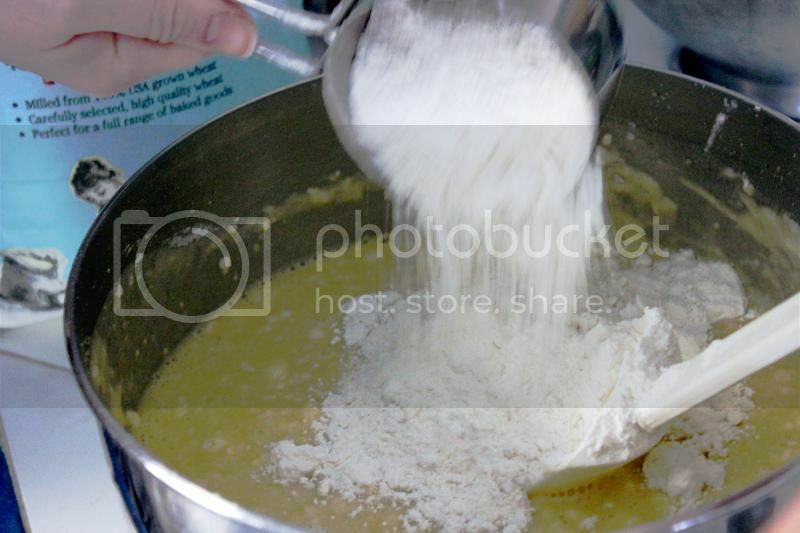 You'll be like oh man, there are some lumps of flour in that liquid. It's okay. They'll go away. Keep going. You can do it! Forearm strength! See? It can be done. 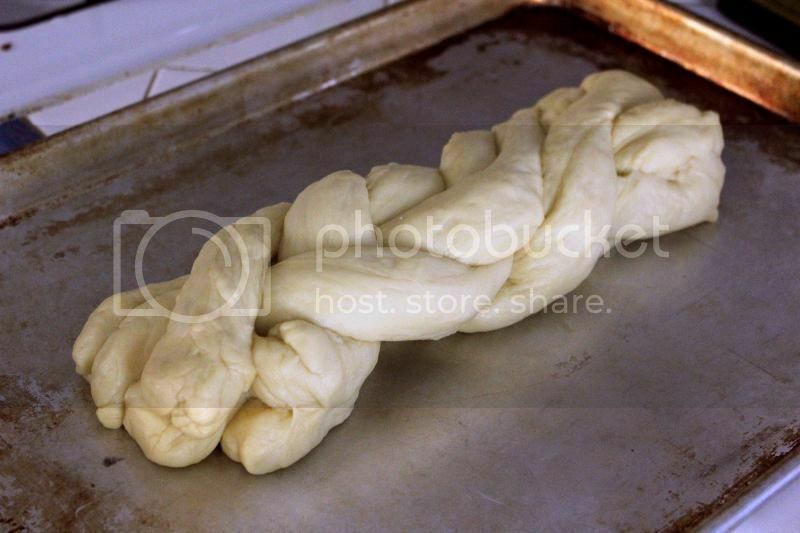 It's now ready to be kneaded. 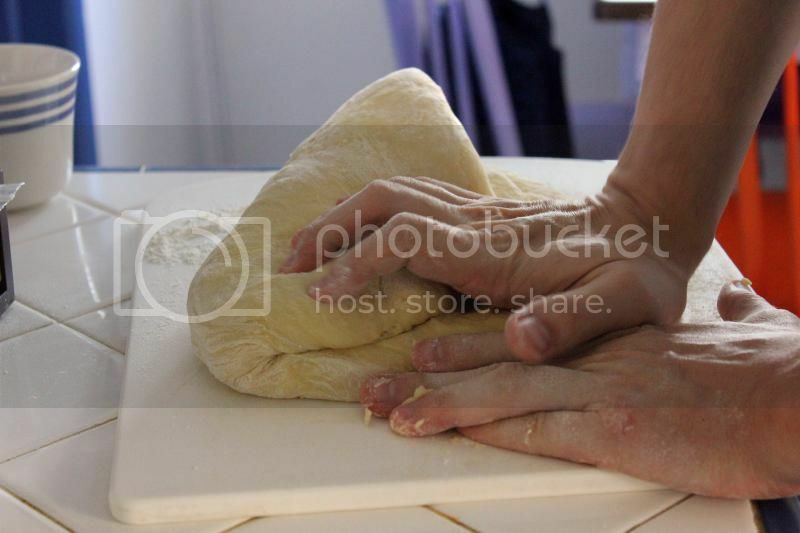 Knead it, baby! Those aren't my hands, btw, those are boyfriend hands. 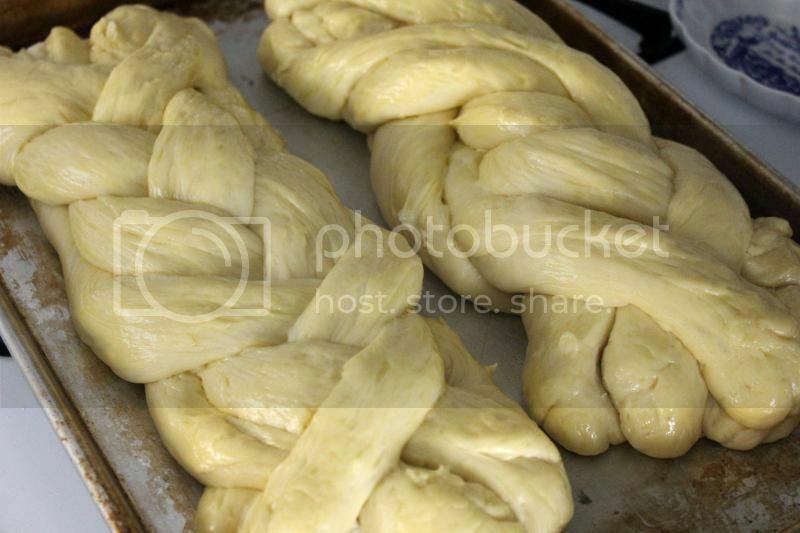 We switched it up and I took most of the pictures this time, while he did a lot of the mixing and kneading and braiding! Grease your bowl, cover it with plastic wrap, let it rise in a warm place for an hour until about doubled. 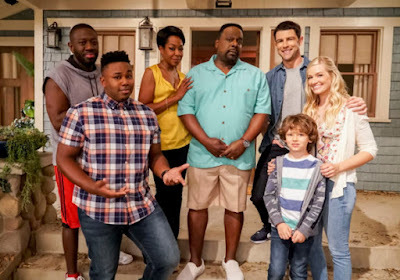 Everyone's favorite part - the punch! Wa-pow! Once you've punched it down, put the wrap back on and back in the warm place for another half hour. Take half the dough, and split that half into six balls. Turn those balls into strands. And braid those bits together. Repeat with the other half. Put on a greased cookie sheet and brush with your last egg. Let rise for another hour. Preheat your oven to 375F. After that hour, brush again with the egg. Then stick that in the oven for 30-40 minutes until golden. Golden and delicious! Let it cool! Then slice into it! Make some french toast. Make a BLT. Just eat it straight from the loaf. Enjoy!